Subscribe-O-Matic. It is a wearable mesh flower with fluttering butterflies. Packaged in 5 ice-creamy colours, each includes a holding pose for the left hand. If you miss the initial inventory offer, pop by the store and get it from the Subscribe-O history, or from group notices. 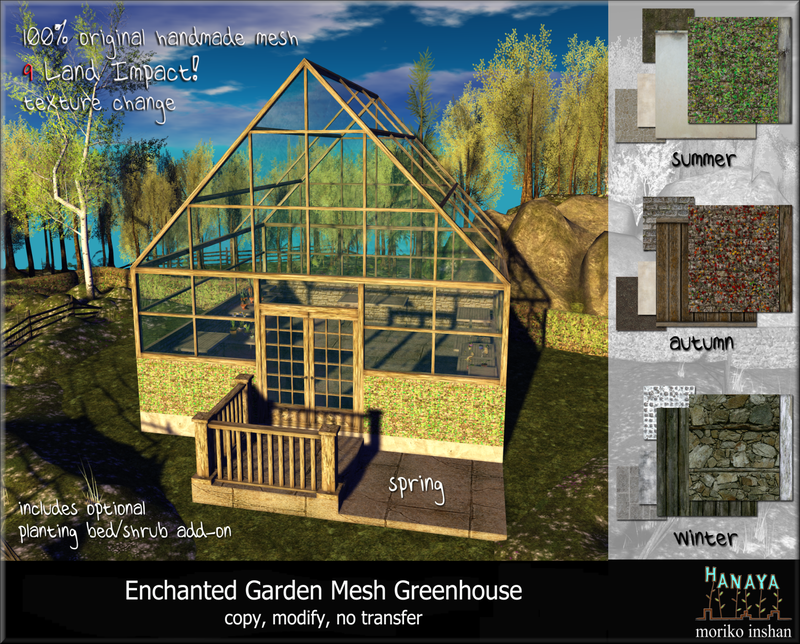 Second, we are participating in the Spring Market and Umbrella Hunt at the Old Europe sim. 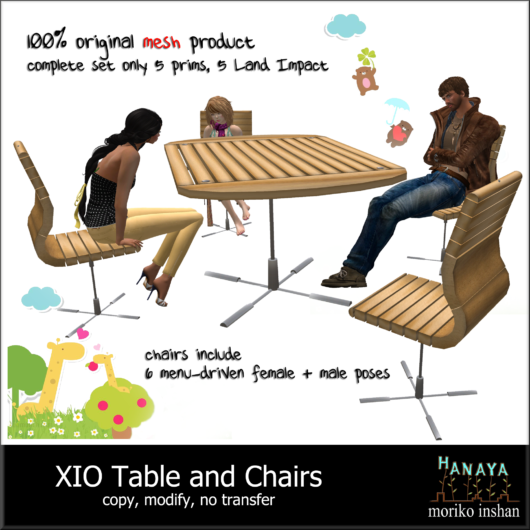 We have a cute little cart set up with spring products, and a super-low li table and chairs (see image below). The gift is easy to find, just look for the umbrella leaning against our cart. But watch your step – the place is pretty laggy. 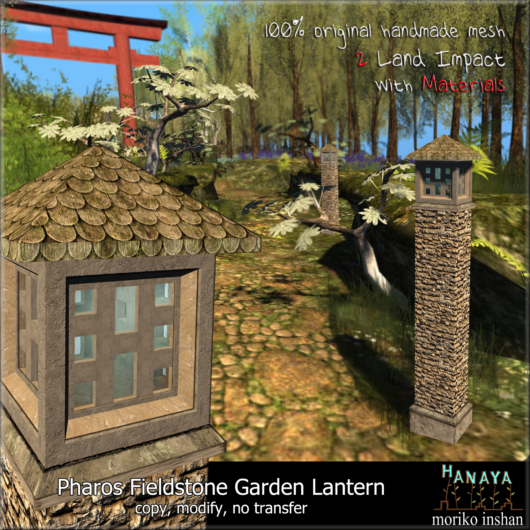 Also, if you haven’t already, stop by -Hanaya- in-world and grab our hunt gifts for the HomeStuff and World Tour hunts, which both end tomorrow. More news on gifts follows in a day or two. 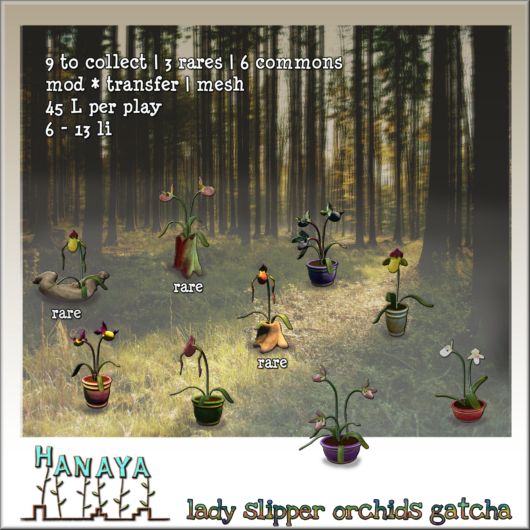 Stay tuned for the pic of our monthly -Hanaya- VIP group gift for April, as well as the hunt gift for the Evil Bunny Hunt, which starts on April 1st. This entry was posted in Events, Freebies and Gifts on March 30, 2014 by moriko. 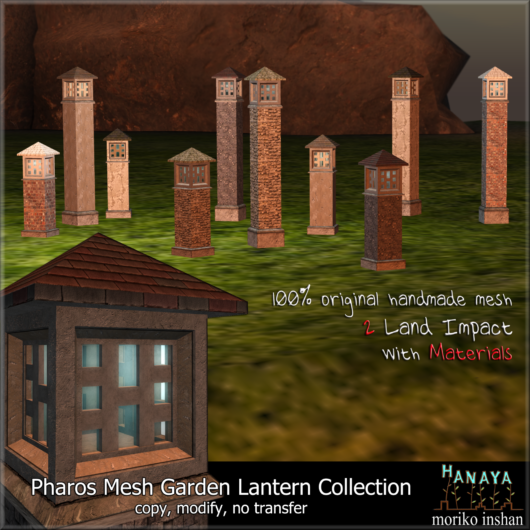 Brand new from -Hanaya- for your spring landscaping needs – we bring you original mesh garden lanterns created in our workshop. Designed to perform double duty as focus points and gentle lighting, our lanterns will harmonize with many different styles of plantings. 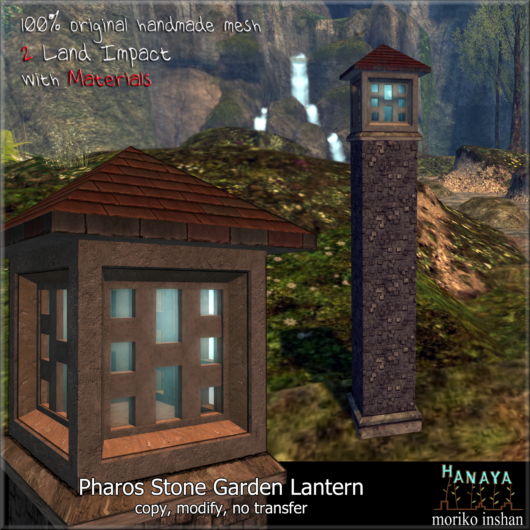 The lanterns are available in 5 different designs, and each pack includes a tall and short lantern with copy/modify permissions. 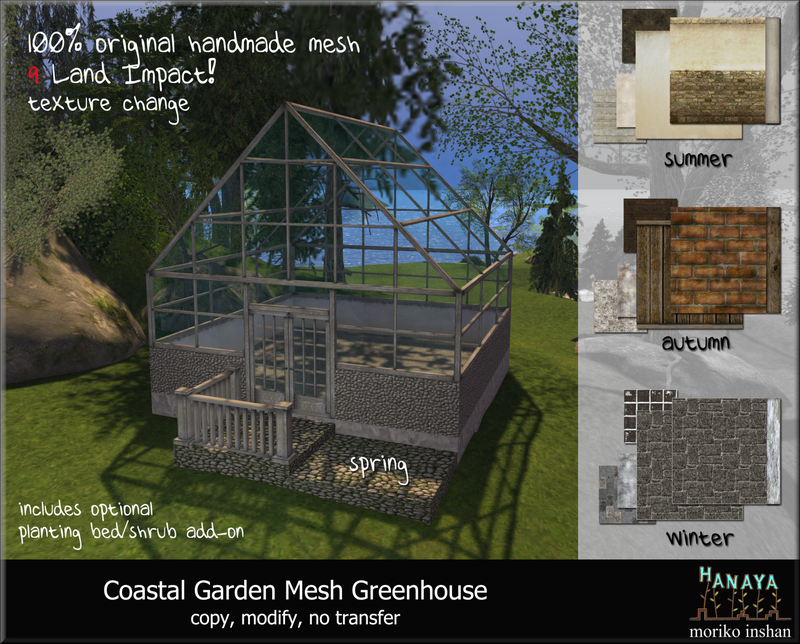 Super detailed, with 3-D multiple layer materials textures and Land Impact of 2. 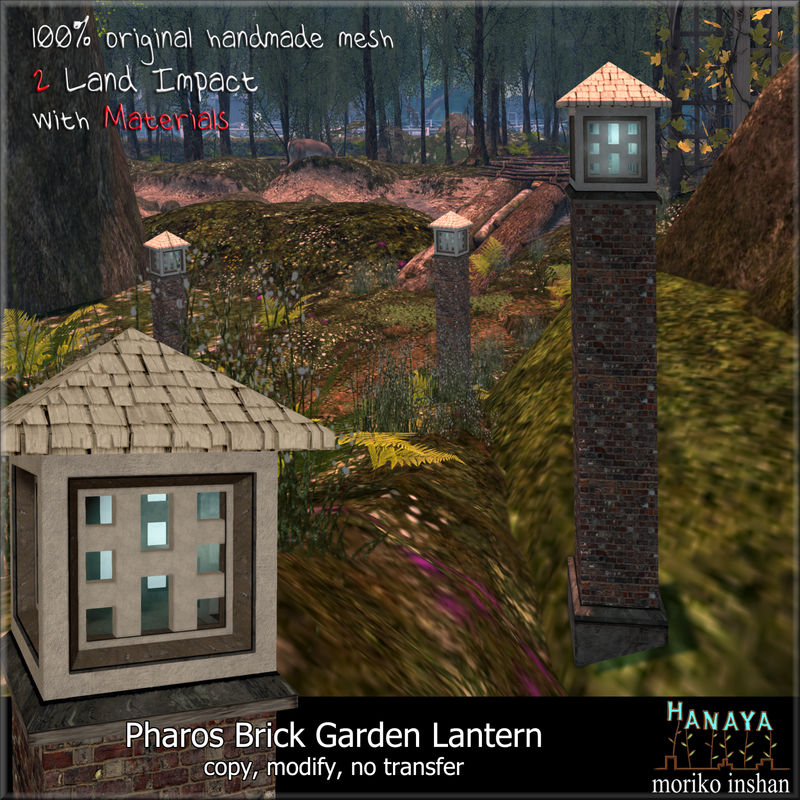 Architectural hardscape elements like our garden lanterns bring cohesion and vertical points of interest to your landscape and can be placed to lead the eye in a direction that is particularly interesting. 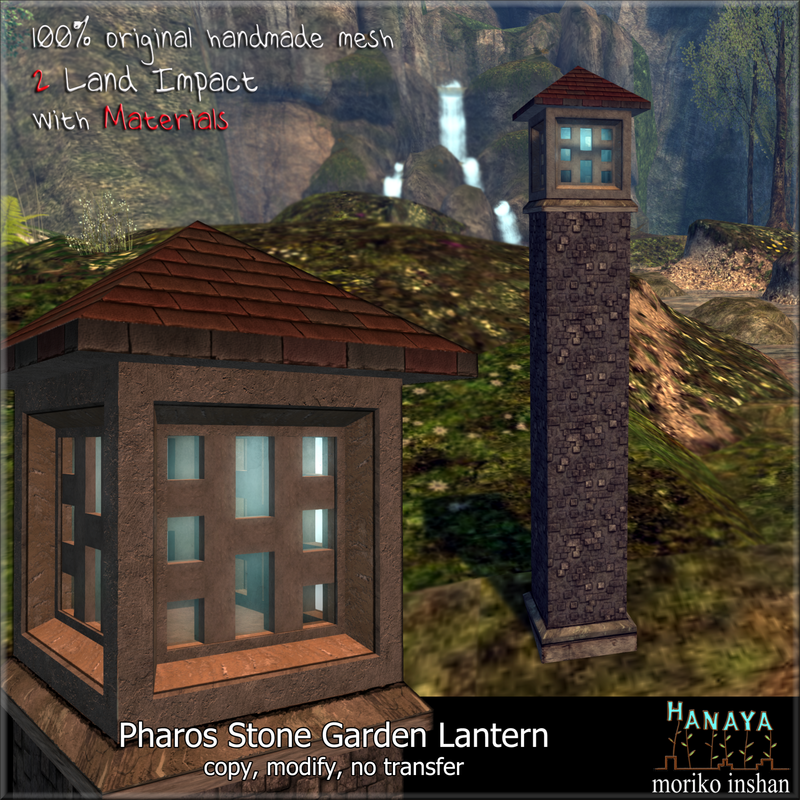 The lanterns contain a low lag script that casts a gentle light. Simply touch to activate and cycle through different levels of intensity. Or if you prefer, you may remove the script without damaging the unit. Keep a back up in case you change your mind. 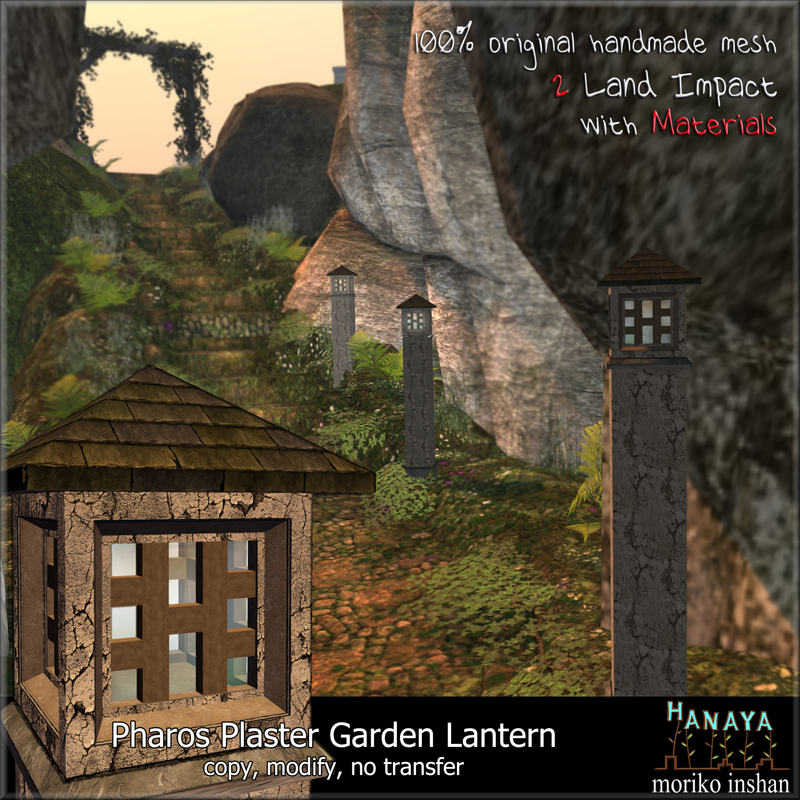 Whether it is weathered stone, brick, plaster, concrete or fieldstone, all the Pharos garden lanterns are original designs with a meticulously textured finish. To get the best experience from the 3-D layered Materials, activate the Advanced Lighting Model in Preferences, Graphics Settings. We found that the lanterns are particularly effective when placed along a pathway, creating continuity and gently drawing your eye forward as you walk. Can’t decide which you like the best? Get all 5 styles in the collection and save. All -Hanaya- Pharos Mesh Garden Lanterns are now on display and available for purchase at our in-world store, as well as on the Second Life Marketplace and PrimBay. This entry was posted in Product Announcements on March 14, 2014 by moriko. 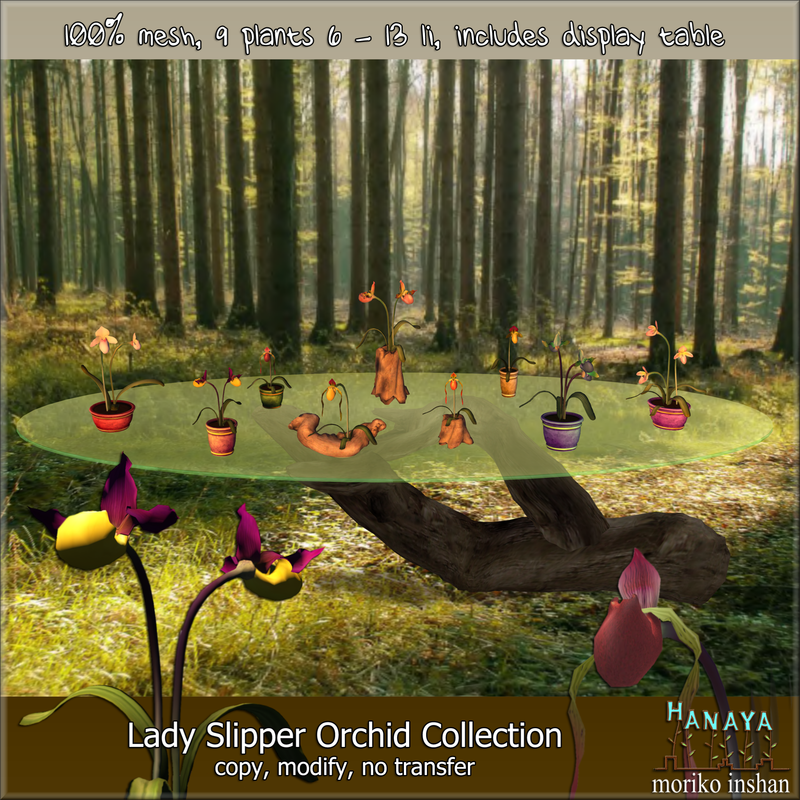 In a clearing, beneath ancient pines, lady slipper orchids sway gently in the spring breeze. Meticulously crafted and textured, each individual plant is lovingly placed into colour co-ordinated pots, or stuffed into the lovely piece of driftwood. A perfect little collectible to share with your friends. And for those who want a copy/mod version, here is the complete collection. Our lady slipper orchids and containers are 100% mesh, with a Land Impact of 6 – 13 (depending on complexity). 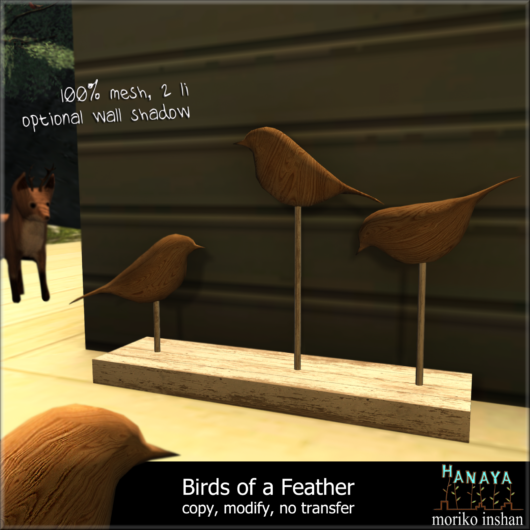 Currently on display at -Hanaya- in-world location, and available for purchase on the Second Life Marketplace and PrimBay. This entry was posted in Product Announcements on March 11, 2014 by moriko. 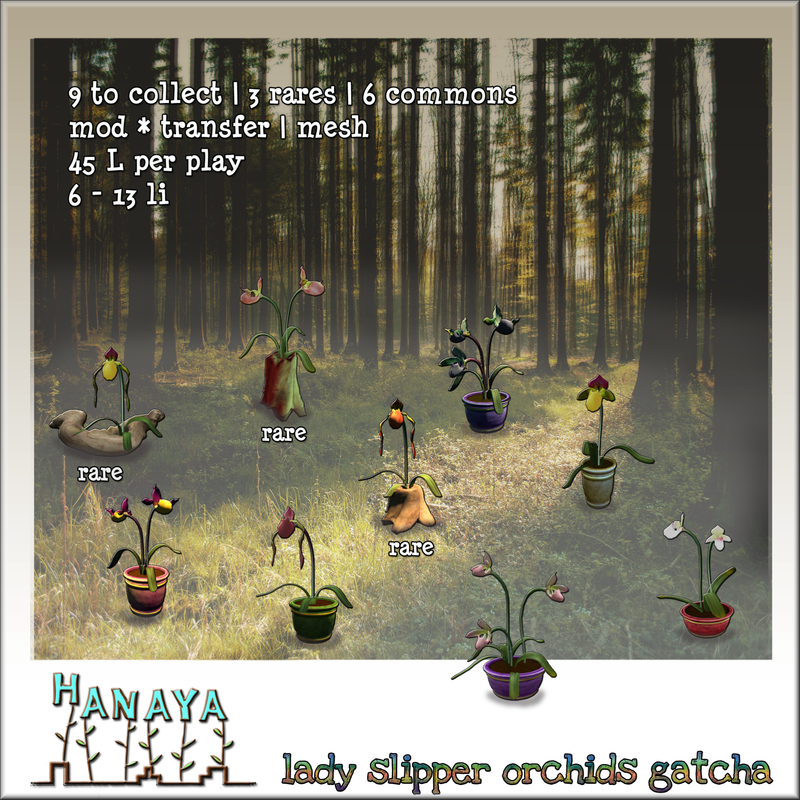 -Hanaya- is partipating in the HomeStuff Hunt this month, and our gift to hunters is a cute meshy 3-D art piece to decorate your home or garden. After potting up plants in the greenhouse, wash your hands thoroughly. 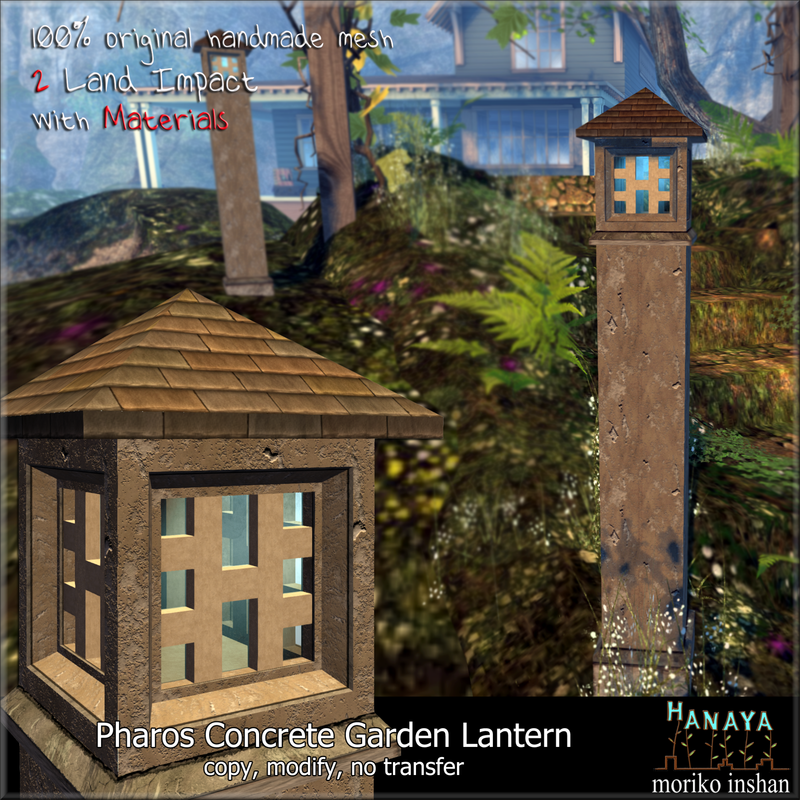 This entry was posted in Freebies and Gifts on March 11, 2014 by moriko.